Home > Roofing Technical Guidance from CRCA > Bulletins > Roof Re-Covering – An Alternative? Roof Re-Covering – An Alternative? In the past, when a roof had reached the end of its useful service life and was no longer economical to maintain or repair, building owners usually had no other alternative but to replace it. Today, with the advent of new products and systems re-cover is sometimes being offered as an alternative to stripping off the old roof system and replacing it in its entirety. The CRCA Roofing Specifications manual defines re-covering as the process of covering an existing roofing system with a new roofing system@.1 Under this broad definition re-cover may consist of applying a new membrane system directly over an existing roof, including its membrane, or applying it over the existing insulation after the old membrane has been removed. In either case, a substantial portion of the existing assembly is left in place. Many products are actively being promoted as re-cover materials. These include metal roofing, single ply membranes, modified bitumen membranes and even traditional built-up roofing (BUR) materials. However amenable these products are to re-cover, there are some important caveats that designers and building owners should consider before they choose the re-cover option. On the surface, re-covering appears to have many advantages. One obvious advantage is the avoided cost of replacing all the components. Others include the reduced disturbance to the building operations and occupants; shorter work schedules; ease of thermally upgrading the roof; and the avoidance of environmental costs associated with disposing of the existing materials into landfills. Keeping the existing vapour retarder and membrane intact also leaves the building less prone to leakage during the reconstruction of the roof. However, any or all of these gains will be lost if the re-covered roof fails to perform or lasts for substantially less time than expected. Reroofing with complete tear off has a number of advantages over re-cover. First, by removing all of the old roofing materials, the structural deck and associated items such as nailers, blocking, air/vapour seals and transitions can be carefully examined. As the performance of all roofing system is directly related to the condition of these components, it is essential that any defects be corrected prior to the installation of a new roof cover. In re-cover situations, these items are hidden from view and cannot be easily assessed or repaired. Furthermore, it is extremely difficult to locate and identify any areas of the existing roof that may have suffered from moisture contamination. A series of simple test cuts should never be relied so as the basis of determining whether there is moisture trapped within the old system. Although various non-destructive moisture detection methods, such as Infrared Thermography and Nuclear Moisture Scanning, can be used to examine roofs for wet areas, they all have limitations. Many roofing systems do not lend themselves to these types of surveys. Moreover, although they may be useful in finding wet areas of a roof, they will, generally, not reveal the cause of the moisture infiltration. Re-covering a roof that has been moisture contaminated as a result of condensation, air leakage, or leaky roof top units will not eliminate these problems. Unless these defects are rectified, they will be built into the new assembly, and the harmful moisture ingression will continue. 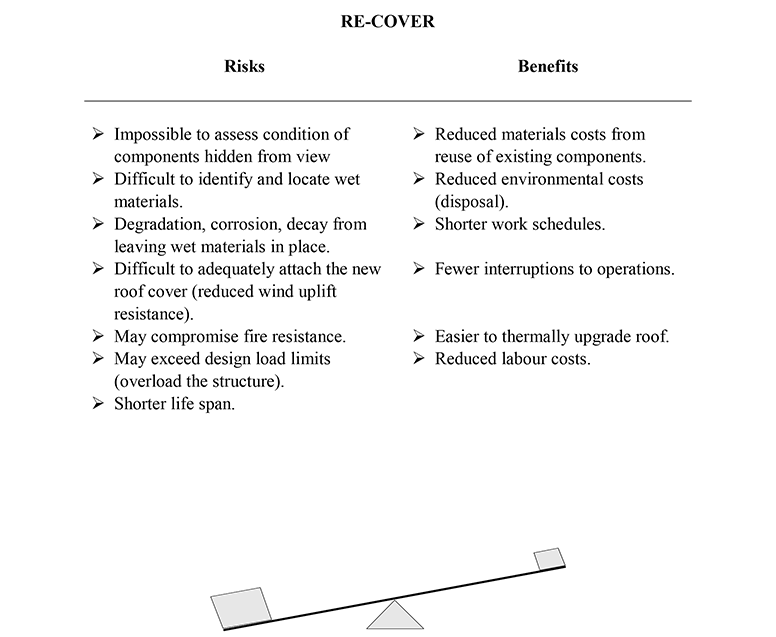 Along with the consequences of re-cover on wind resistance, the fire resistance and structural capacity of the roof must also be taken into account. Covering fire walls, or failing to provide fire stops as prescribed by building codes may result in an assembly that does not conform to code requirements. When thermally upgrading the assembly, one must be aware that increasing the thickness of the insulation may affect the fire rating (fire resistance is a function of the mass of the materials).4 Simply adding additional plies to an existing b.u.r. roof will most likely reduce its fire resistance. Additional gravel, or ballast, in a re-cover system may result in the design load limits being exceeded. Brooming gravel from the existing roof and improper piling can overload structural members causing collapse. Prior to considering re-cover, every effort should be made to determine what factors have necessitated the repair or reconstruction. Has the roof simply worn out due to exposure and weathering, or are their latent defects that have led to the need to restore the roof? In a fully adhered system, placing a new membrane over a roof which exhibits extensive ridging due to a dimensionally unstable insulation will only mask the problem for a short while. In all likelihood, the ridges will reappear in the new system in short order. Are their latent design defects in the existing construction, such as inadequate drainage or improper air/vapour seals? Re-cover will not address these problems. Placing a new roof cover over a system with these deficiencies may only serve to make effective and permanent solutions more costly and difficult in the future. Assuming that recover will not adversely affect the fire, wind and structural requirements of the project, and that there are no latent defects or moisture within the existing system, is it worthwhile to consider recover? This decision will depend on the level of risk that the owner is willing to accept. offer warranties on such installations. Nevertheless, re-cover may be an acceptable alternative provided that the owner has realistic expectations of its potential performance and calculated all of the risks involved. A prudent owner will always carry out a thorough risk analysis prior to proceeding with a re-cover. Initial design and configuration may dictate which roofs may be suitable candidates for re-cover. Incorporating overlay boards may facilitate the removal of only the membrane portion of the roof only when it has worn out. Installing a vapour retarder over a thin layer of insulation or a thermal barrier may avoid the need to replace it along with the insulation and membrane. However, even in these cases, careful thought and extensive assessment of existing conditions is required before a re-cover is considered. Each roof must be considered individually and the risks of re-cover calculated for each situation. Re-cover may provide short term gain by reducing initial costs, but the long term consequences and costs may be far greater than anticipated. CRCA Roofing Specifications Manual, 1997 Edition. CAN/CGSB-51.25-M87, Thermal Insulation, Phenolic, Faced. Factory Mutual Engineering (Research) Corporation, Loss Prevention Data 1-29, June 1996. Parks, R. L and Berhinig, R. M., Fire Performance of Replaced and Recovered Roof Assemblies, Proceedings of the 8th Conference on Roofing Technology, NRCA, 1987.